Pesticides (herbicides, insecticides and fungicides) are tank-mixed for various reasons including cost saving and time management. While it is common practice to tank-mix products, it is important to note that pesticides are chemicals that can react with one another to create both biological and physical interactions. Physical interactions are more noticeable because they cause a visible reaction in the spray tank. Biological interactions are more difficult to detect as products may mix well, but the efficacy of one or more of the tank-mix pesticides may be affected. Pesticide companies can only guarantee the efficacy of tank-mixtures that have been tested and are stipulated on the label. Synergism (the efficacy of the combination is more than the sum total of the individual components.) This may have the advantage of increased pest control, but it also has the potential disadvantage of crop damage. Antagonism (the efficacy of the combination is less than the sum total of the individual components.) This will reduce the risk of crop damage, but may result in inadequate pest control. Pesticides may interact physically with one another to create spray mixtures that may induce a heat reaction, flocculate, precipitate or form clumps that will block nozzles and reduce the efficacy of one or more of the tank-mix components. This could result in having to discard the entire tank contents. Always follow label recommendations and do not make unregistered tank mixtures. 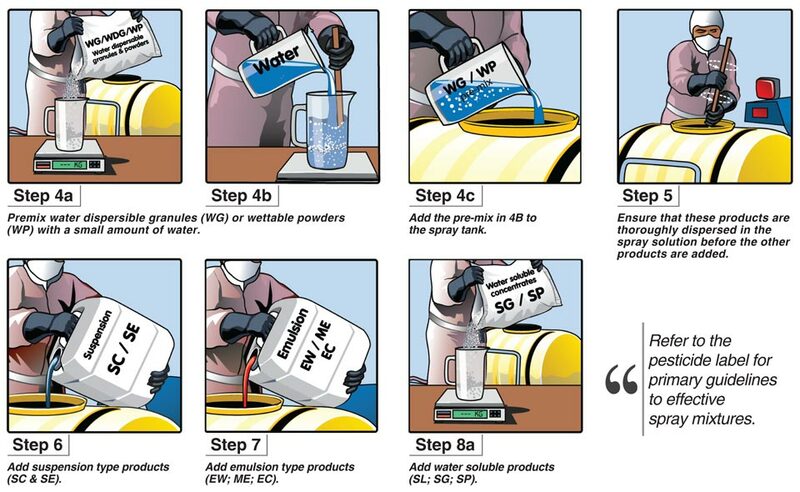 Ensure that the water quality is adequate for the tank-mix components. Many pesticide labels have specifications regarding electrical conductivity or pH of spray water. If a product label states that one pesticide is compatible with another, this normally does not mean that this is true for all of the trade names for those active ingredients. Remember that different formulations of a particular active ingredient may not be exactly the same. The more pesticides that are tank-mixed, the greater the risk of an unwanted reaction. Tank mixtures in low water volumes are more conducive to physical incompatibility. The reason for this is that there may not be enough water to keep everything in solution/emulsion/suspension. Avoid too many tank-mix components or use higher water volumes in these cases. Low spray water temperature may contribute to an incompatible spray mixture. Mixtures of products with contrasting pH levels and requirements could cause incompatibility. Mixtures of products with high salt loadings (like foliar nutrients and certain herbicides) may influence the formulation of other pesticides and reduce their compatibility. Never mix neat, undiluted products unless stipulated on the label. Always use the label recommended adjuvant. Agitate tank mixtures as this is important to keep products in suspension and emulsion. Keep in mind that certain products must be pre-mixed with a small amount of water before they are added to the spray tank. This is particularly true for powder and granular formulations. Please follow label recommendations. The spray mixture must never be left un-agitated, therefore the spraying proses must be completed with continual agitation. This is a general procedure and must be followed when in doubt. The pesticide label must be followed as a primary guideline. Remember to fill the spray tank at least half full. Fill the tank to the desired volume. Guidelines have been formulated to ensure optimal efficiency of spray solutions, and cater for most conditions. However, the authors do not presume responsibility for effectiveness under all conditions. Incompatible spray mixtures could render the product ineffective. Refer to the pesticide label for primary guidelines to effective spray mixtures. Article submitted by Gerbrandt Kriel and Lean Hanekom from Villa Crop Protection. For more information, send an email to hanekom@wenkem.co.za.